Hello again!You have arrived at Loule. 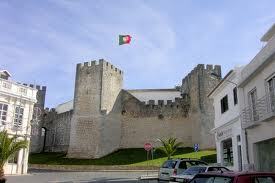 Fabulous must visit central Algarve town!Please scroll down to see information and pictures. Please click here.When you want to go back to our main Information page and index. stunning 2 bedroom apartment .Or equally lovely, one bedroom apartment This is one of my favourite towns on the Algarve.The image to your left is of the Arab architecture of the main market.It is an incredible large building containing a truly vibrant all week market.A must see! So important was it by this time that in medieval times the king of Portugal gave it,its own Fair;the only one on the Algarve. Loule is a big town and there is much to see as it is bustling and very traditional.Managing to be both modern and traditional at the same time.I would advise to allow a day if you can to enjoy the place.It is famed for its saturday morning gipsy market.You can book trips from most resorts in the Algarve,though i would recommend you walk up to the main Arab style fruit market;if you have time. As you wander around one can see the remains of the old walls which would have once surrounded the town and the arab influence is still very much in evidence.The main church is the Igreja de S Clemente.Where there is an ancient arab cemetry garden Jardin do A Muados. 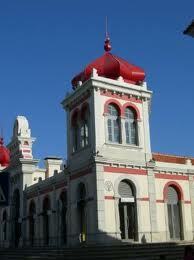 Just down from the castle is the Municipal Art Gallery,nicely housed in the Convent Espiritto Santo. A good time to visit Loule is in february when there is the 3 day very colourful Festival when everybody takes to the streets.One should fit this in if at all possible.If you like to roam around looking at villas then here you will find plenty of sumptuous residences to drool over.As evidence of the wealth of this vibrant town. Finally if your holiday in the Algarve is in march then you should try to fit in the Easter Festival of the Sovereign Mother.The Patron Saint of the town.This is supposed to be as colourful and well attended as the Festival. 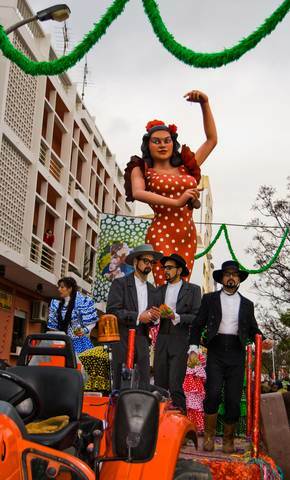 The carnival is one of the most colourfull and well attended events on the Algarve.It is normally held in February but since the date varies from year to year you should check the actual dates if you wish to attend the 3 day festival. It is thought that the first modern carnival was held in 1906 but I suspect something was going on long before this. The highlight is clearly the procession of floats,dancers and dramatical groups that march down the main avenue. You will be well advised to get there as early as you possibly can,as when it gets going you will not find anywhere to park your car.Also you will not be able to get a good vantage point to see the march and displays. If you can get there for this event you will not regret making the effort! You will be amazed by the bright colours and the sheer diversity of the floats and dancing groups.The people of Portugal "do bright colours".These same colours provide the excitement and special atmosphere for the Carnival. Right you see one of the many floats which have such varied themes. Below I always ask myself.Did these headresses originate in Portugal and were exported to South America.Or did the Portuguese first see them in their voyages of dicovery and import them to Portugal. "Answers on a postcard please"
Loule is a few miles inland but there are numerous beaches within 20 minutes drive a few of them being European blue flag. This beautiful sandy beach stretches for several miles alongside the the Quarteira promenade and is very popular in the summer season. Praia Rocha Baixinha Leste is a large flat golden sandy beach close to the Vilamoura Marina with excellent facilities so should be perfect for families with young children. Praia Rocha Baixinha Oeste as you might guess by the name is not far from the previous beach.It is a nice flat sandy beach nearer to Vilamoura.Again having excellent facilities for young families. The wide sandy beach is well sheltered by breakwaters so should be good for young children swimming.Close to the marina of Vilamoura .The sands stretch on very nearly to Quarteira fishing port.All these beaches can be pretty crowded in summertime and there is plenty of nightlife around and about. Tel: 289 417 797 Monday to Friday - 8am to 8pm. Sunday - 8am to 1pm. Almancil Karting is a great favourite with families and groups of young people,alike.Probably best to pre book. Parque Atlantico,or Atlantic Park Quateira,full of water rides, pools and gardens.Great Family entertainment in the sun. Quadbiking,suitable for newcomers to the activity and catering for the more advanced riders. This is worldclass entertainment for all ages and cultures,with swimming pools,places to eat and fun things such as a Pitate ship,where you can get dressed up. This one is open all year.From 10 am to 17.00 pm in wintertime but closed on mondays in January and February.In the summer high season opening times are 10 am untill 19.30 pm. Finally there are tennis courts at the Municipal Park which even have floodlights.